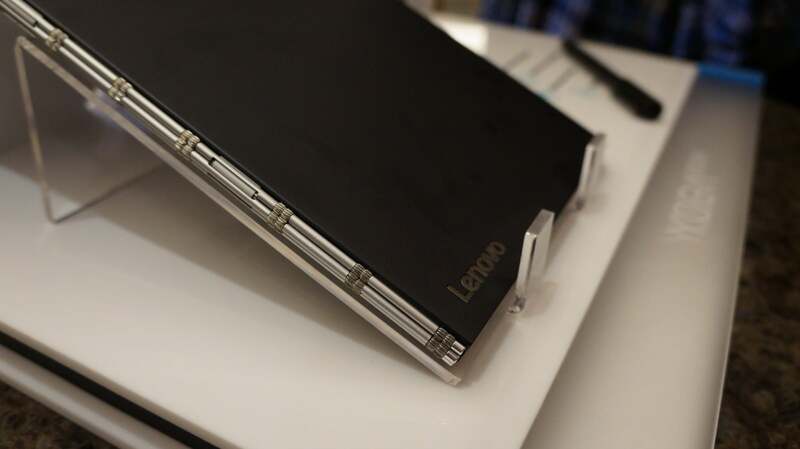 Lenovo, in addition to Yoga Tab 3 Plus, Miix 510 and Moto With Play, presented an interesting hybrid, called Yoga Book. It stands out, above all, very slim design (after the 4.05 mm screen and keyboard, weight 690 grams) made of metal and glass. It is interesting that the device does not have a physical keyboard – the whole is touch. Additionally, you can deactivate the keys to give in a way a kind of graphics tablet. With this panel we can use in two ways. The first is to write using the supplied stylus, which detects 2,048 levels of pressure. The second, much more interesting is the ability to attach the keyboard magnetic pads of paper sheets, after which you can write a stored content quickly appear on the screen hybrids. I must admit, it looks very interesting and innovative. Such solutions can appeal to, first of all, graphic designers, for whom such a way that the introduction of content can greatly facilitate the work. However, it should be borne in mind that the more advanced graphics programs Lenovo Yoga Book not to end up check. So by the fact that the device has an average specification: among other things, the Intel Atom processor and 4GB of RAM 5x. In addition, the device debuted a 10.1-inch display with a resolution of 1920 x 1200, which can be rotated 360 degrees, 64GB built-in memory, expandable and battery with a capacity of 8500mAh. Lightweight doubt have a keyboard used in the this device. There’s no denying that the traditional keyboard is much more comfortable, and writing longer texts on a flat, touch keyboard can be simply tiring. Hybrid will be available this month in two versions: Android 6.0 overlay manufacturer (which adds, among other things, the ability to use several applications at the same time) at a price of 499 euros and Windows at a price of 100 euros higher. The set comes with a stylus and a special notebook to handwritten notes or drawings.